Continuing my “nutrition works” series; 5 good reasons to tuck into fruit for you to digest in 5 minutes or less. People have been fleeing fruit afraid of the sugar content. This is nonsense. Fruits are highly nutritious and supply lots of vitamins, minerals and disease fighting phytonutrients. If you are going for 10 fruit/veg each day then 4 of fruit and 6 of veg is a good balance. If you’re going for 5/day then 2 portions of fruit and 3 of veg is sensible. Remember that the 5 or 10/day message is not just about the number of portions but also about colour. The key is to cover all the colours of the rainbow. 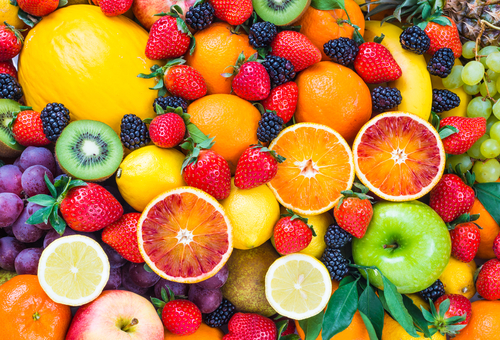 Fruits such as rich red, black and purple berries, orange mangoes and oranges and green kiwis and apples can really help you achieve this goal. You’ll find it even easier if you mix frozen fruits and tinned fruit in natural juice with what’s fresh and in season. Fruits make a great nutrient packed snack with much less fat, sugar, calories and salt than our usual snack attack favourites crisps, biscuits and chocolate bars. Fruit helps bump up your fibre intake. An apple, orange or pear will give you 3-5g fibre depending on the size and a handful of berry fruit about 3-4g. We should all be aiming for 30g/day so 2-3 portions of fruit can make a great contribution. Fruit can create great taste sensations in savoury dishes as well as sweet. Try adding lemons or dried apricots to a tagine, experiment with adding different fruits to salad. Plums or oranges are great with duck, apples or pears are fantastic with pork, lemon is great with fish. Get adventurous and try some new recipes. Here are some links to a few of my favourite savoury fruity recipes to get your started. As you can see from the nutritional analysis these recipes are still low in sugar. This entry was posted in Nutrition works, Tuck into fruit by Stephanie.fade. Bookmark the permalink.